Good morning everyone, today I'm changing things up a little and switching topics to food and in particular snacks. I think we are all looking for healthier alternatives to crisps and when you have allergies I bet you don't leave the house without emergency snacks in your bag. Nuto peaked my interest when I first sampled them at NOPE 2016 and I recently invited owner and founder, Puja for an interview. After having spent nearly two decades in the City in Finance, I decided to venture out into the unknown and start my own business. The motivation for taking this decision was simple, I wanted to spend quality time with my daughter and yet still work on something that I am passionate about. I am a big foodie, so I knew my venture would be food related. I like to eat well, and a healthy lifestyle is very important to my family and me especially now that I’m a mum. I found that I could always find healthy meals but when it came to snacks, this was not the case. Either they were full of sodium or sugar, listed with ingredients that I didn’t recognise or were tasteless. As a result, I set my mind on developing a snack that would be good for adults and children alike, but yet still full of flavour! Why did you decide to create a product using lotus seeds? I love snacking and there are so many choices out there in the market. However, I always felt guilty after digging into a bag of crisp or popcorn and never felt there was a snack that was healthy and delicious enough to satisfy my cravings. Having grown up on the Lotus Seeds, albeit in a simpler format, I knew that they had numerous health benefits, and this got me thinking about presenting these seeds in a popped, seasoned format for the consumer market. I thought consumers would appreciate the experience of opening a bag and having a snack that is not only deliciously crunchy but also genuinely nutritional. What makes them special compared to other snacks? First and foremost, this snack is not available in the market and we are introducing it for the first time in the U.K. and continental Europe. We believe this snack will not be fighting for shelf space with the traditional crisp and popcorn offering, as it’s truly a unique snack category in itself. After all it’s a seed, that’s been transformed using a unique process to allow consumers to eat healthy, benefit from the nutritional content but yet still feel like they’ve had a snack. In terms of nutritional content, the Lotus Seeds are second to none. Each bag is less than 100 calories (these are air popped and this makes them extremely light), gluten free, vegan and have no added preservatives or artificial colours. They are high in fiber and are a good source of protein with more than a dozen minerals and nutrients. All this packed in a 23g bag with just a few simple ingredients that everybody recognises. Our snacks are delicately seasoned, and as a result do not leave you craving water like many other snacks and nor are they high in sugar which leave you lethargic! Lastly, they make for a perfect pantry item as they have a 12-month shelf life. In my humble opinion, you simply cannot go wrong with these snacks. What are the highs and lows to running your own business? Running a business is hard work (there are no easy shortcuts!). There never seems to be enough hours in the day, as I’m constantly juggling various aspects of the business including production, sales, marketing or generating and maintaining relationships with buyers & suppliers to list a few things. I would say the highs for me include being my own boss, making my own hours and truly working on something that I am passionate about and can stand behind 100%. 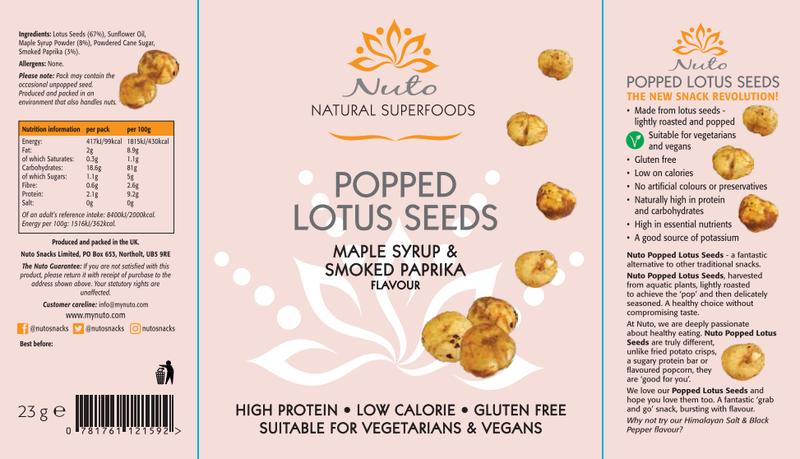 I love seeing customer’s reaction when they try my snack for the first time and are pleasantly surprised about our Popped Lotus Seeds. But probably the best feeling is when I walk into a store and see my products on the shelf and my daughter recognises the bags. Over the last year I have gained so much confidence in myself and believe if you put your mind to anything you can achieve it. In terms of lows, I initially missed having a defined role in a structured workplace. I have always worked in large organisations and in teams and therefore had colleagues to discuss and tackle problems with. I am very grateful to have this opportunity at this time in my life and to evolve and gain a new skill set. Although running your own business is not easy, it has been one of the most rewarding experiences of my career thus far. I would encourage anyone who has a dream to purse his or her business venture and give it shot, nothing compares to seeing your idea cultivate from a small seed to a growing & thriving business. What does the future hold for Nuto Snacks? 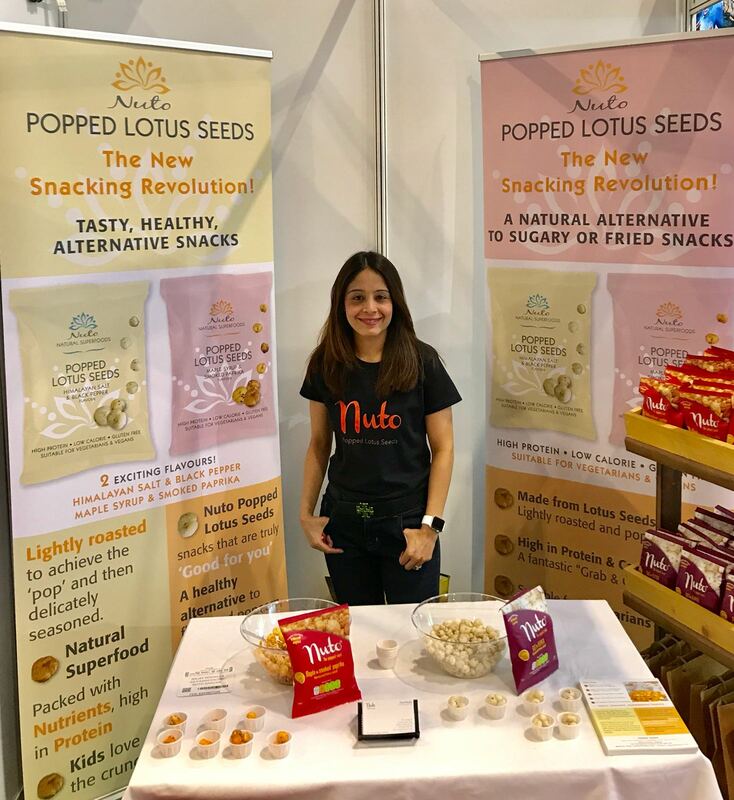 We are just getting things started, our presence at the FDE 2018 was a huge success, more than anything it was really nice for us to get such a positive feedback about the Popped Lotus Seed and the unique position of the snack in the market. Since the show we have had increased interest from various countries in Europe and lately from North America. People have been reaching out to work with us or stock the product, which has completely turned the tables around. It’s a busy time here right now, and we are working extremely hard to raise awareness of the Lotus Seed and its benefits. Our goal is to get the product stocked and listed into 1 of the major grocery retailers during the next 12 months and to increase our marketing efforts this year with campaigns and social media. It is important at this stage to educate the consumer about the product. Simultaneously we want to keep increasing our reach with the online sales, wholesalers, distributors and the independent/small businesses across UK and Europe. We will always be grateful to them for supporting us and taking a chance on our new snack. Our ultimate goal is to see our Popped Lotus Seed snack as an alternative in the market.